Just take a moment to make sure you understand what's going on here. 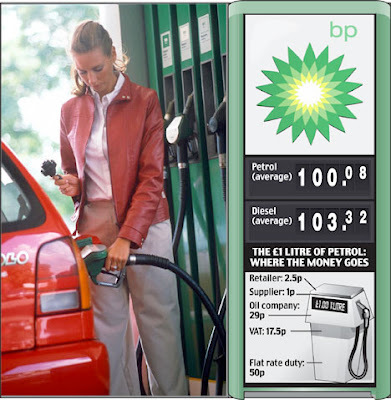 Since Labour came to power, the average pump price of unleaded petrol has increased from 55.8p per litre to 100.06p, a rise of 44.3p (79%). 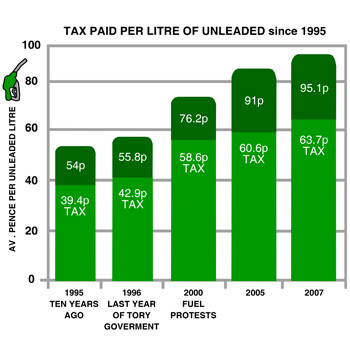 Of that extra 44.3p, no less than 24.6p comprises higher tax- more than half of the total price hike. Or to put it another way, this government has racked up petrol taxes twice as fast as inflation (a tax increase of 57% vs inflation of 30%). Despite those $100 per barrel oil prices, more than two-thirds of today's ruinous petrol price is tax.